There are several analog-to-digital converter architectures described in the literature that implement a nonlinear conversion characteristic. This chapter presents an overview of the different architectures and how the nonlinear characteristic is achieved and summarizes the state-of-the-art for each of the architectures. Most of the architectures described in the following sections can be used to implement arbitrary nonlinear transfer characteristics, however most of the examples found in the literature show logarithmic transfer functions. 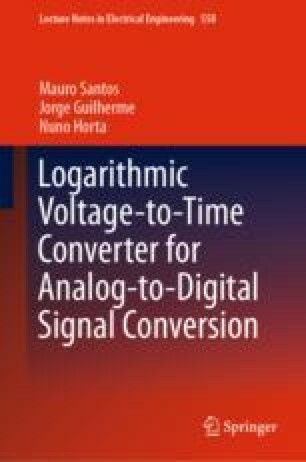 For the same conversion resolution, a logarithmic converter can attain a larger input dynamic range than a linear converter, conversely for linear and logarithmic converters with a similar input dynamic range, the logarithmic converter will attain a smaller signal to noise ratio. Figure 2.1 shows an example of a conversion result of a sinusoidal signal by converters with different conversions characteristics. On the left, the conversion result for a linear converter shows a constant quantization step while for the other two converters the quantization step is not constant. The floating-point converter is characterized by having zones with a constant quantization step, with the quantization step being different from zone to zone. The logarithmic converter on the other hand does not have a fixed quantization step like the linear converter, or zones where the quantization step is fixed like in the floating-point converter. In the logarithmic converter the quantization step increases progressively from a small quantization step for small input signals to a large quantization step for large input signals.